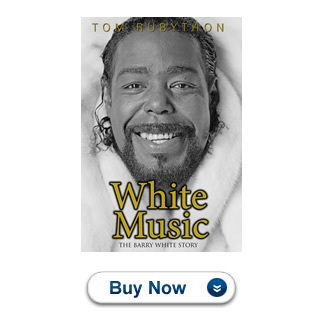 White Music, the new biography of Barry White, by Tom Rubython is the first ever in-depth book about the life of Barry White, one of the greatest soul singers in musical history. Throughout his life he was addressed as Maestro and is probably the most complete all-round talent ever measured as a performer, lyricist, musician, orchestrator, arranger and producer. The Barry White story is dramatic right from his debut as a piano prodigy at four-years-old to a spell in prison at 16, to father of four at 18 and then ten years of often-menial struggle to finally make it as a global superstar. In 1974, he was briefly the world’s biggest selling musical artist. The book is incredibly detailed and an in-depth study of not only the man and his multi-faceted life but also his music, some 35 albums in a 30-year career. His music was all about love and from 1973 until the end of the decade, the birth rate in the United Sates went up five per cent. An article in the New York Times in 1976 attributed it to Americans making love to the sound of Barry White’s music. Not all aspects Barry White’s life were particularly pretty and the book details his early years as a youth when he took to a life of crime and ended up in prison for seven months for grand theft. He was later re-arrested as a suspected murderer. He reformed after listening to Elvis Presley’s It’s Now Or Never in prison. Tom Rubython is the former editor of F1 Magazine, BusinessF1 and SportsPro magazine. He is author of Life of Senna, the biggest selling third party written driver biography ever. Well known as a specialist business writer for thirty year he has also written about Formula One since 1999. Rubython made his name as the only journalist who regularly wrote about the business of Formula One and he is a friend of many of the people at the top of the sport.